Check our out complete Samsung Galaxy S3 review. Part of the problem may be due to supply constraints. Sprint and T-Mobile have both sort of delayed the phone due to supply issues. T-Mobile is only launching the phone in 29 major cities today and Sprint is fulfilling pre-orders but that appears to be it. Android Authority has listed the cities for T-Mobile. Below is a recap of what you can expect from the Galaxy S3 on each carrier today. We’ll try to update this list as the phone becomes available. Please comment and let us know when or where the S3 is available. AT&T is only selling the 16GB version of the Galaxy S3 for $200 with a two-year contract ($550 without). You can choose between white or blue. For now, it is only available for pre-order on AT&T’s site. The pre-order has free shipping. UPDATE 6/26/2012: No change on AT&T. All versions are still available for pre-order only. UPDATE 7/05/2012: AT&T has announced that the Galaxy S3 will be available in AT&T stores tomorrow, July 6. UPDATE 7/10/2012: The S3 is available on AT&T and advertised on the homepage. Free shipping if you order online. The Sprint pre-order pages for the Galaxy S3 16GB version and 32GB version are up, but both versions are “out of stock.” The pre-orders are closed as well, but Sprint says to “check back” at some future time. Like AT&T, the 16GB phone is $200 with a two-year contract and $550 without. The 32GB version is $250 with contract and $600 without. Sprint also has a note on the page saying that Samsung is to blame for the device shortages, but pre-orders are going out. UPDATE 6/26/2012: No changes on Sprint. All S3 versions are still out of stock and the pre-order is closed. UPDATE 7/05/2012: Both models are now up for sale and the out of stock signs have disappeared. 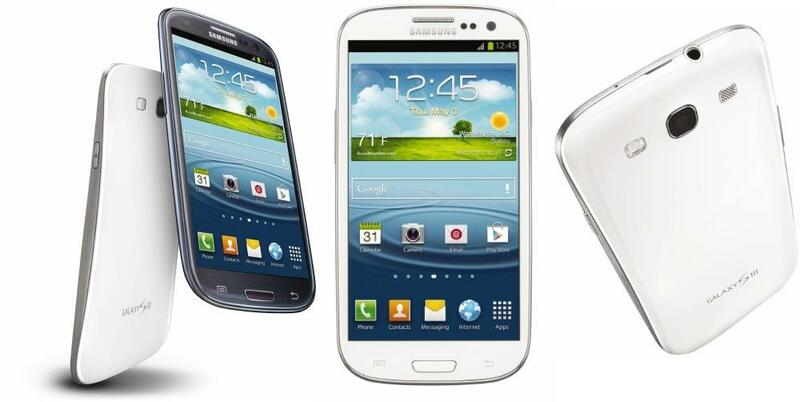 It looks like you can order a Galaxy S3 on Sprint for the first time. T-Mobile is selling the Galaxy S3 right now, but it wants you to pay dearly for the privilege of buying it. The 16GB Galaxy S3 is priced at $330 with a two-year contract and a $50 mail-in rebate, which brings the price down to $280 ($630 without any contract). The 32GB S3 is just about the most expensive contracted smartphone ever at $380 with a $50 mail-in rebate, which eventually drops it back down to $330 ($680 without). Both versions are available in blue or white, though we only linked to the white versions. If you’re trying to find them in stores, you’ll have to check out this list of cities for the time being. UPDATE 6/26/2012: Both the blue and white 32GB Galaxy S3 versions are out of stock at T-Mobile.com. The 16GB versions are still available. The Verizon pre-order page up for the Galaxy S III is still up and it starts at $200 with a two-year contract. We believe Verizon is selling the 32GB and 16GB versions in blue and white, but the “Pre-Order Now” button isn’t working properly for us. UPDATE 6/26/2012: The phone is still up for pre-order and it’s still not working for us. Online retailer HHGregg claims it will have the Verizon version of the phone by July 12th. UPDATE 7/05/2012: Verizon now has pre-order pages for the Galaxy S3 16GB ($200) and 32GB ($250) versions. Both “will ship by 7/11,” validating earlier rumors. Verizon has both the blue and white versions. Droid-Life has noted that some customers who pre-ordered may receive their S3 as early as tomorrow, July 6. UPDATE 7/10/2012: It looks like Verizon will now get the Galaxy S3 on July 12 instead of the 11th. UPDATE 7/12/2012: Verizon has sent us an email indicating that the S3 is available. With the four big carriers hurting to get shipments for the Galaxy S3, we feel bad for poor US Cellular, which will likely get the shaft. US Cellular is currently offering pre-orders for the 16GB S3 in white and blue for $300 with a two-year contract, but it comes with a $100 mail-in rebate. The 32GB white version is also for sale, and costs $350 with a contract and also comes with a $100 mail-in rebate. This page has all three Galaxy S3 US Cellular phones on it. UPDATE 6/26/2012: No change. All versions are still up for pre-order. UPDATE 7/05/2012: The blue 32GB version is now missing from the list. It may be sold out. UPDATE 7/10/2012: A hyper commenter has repeatedly told us that the US Cellular Galaxy S3 will come out July 12. I cannot find confirmation of this, but US Cellular has confirmed via Twitter that S3 pre-orders will begin shipping this week and some units will become available in stores. Amazon has AT&T and unlocked versions of the Galaxy S3 available, but all versions appear to be on backorder. Amazon seems to be selling the 16GB version of the S3 for $190 for a new AT&T customer (individual) and $150 for someone renewing. We have no idea what the difference is between Marble White and Ceramic White, but all unlocked versions are 2G/3G only, work on AT&T/T-Mobile, and have a Samsung Exnyos processor instead of a Snapdragon S4 like the US versions. The experience should be relatively identical no matter what processor you get. UPDATE 6/26/2012: Few changes. I’ve updated the pricing and availability of the unlocked versions. All of them are still in limited supply, but they’ve dropped a bit in price. The American versions are still on backorder. UPDATE 7/05/2012: The two American versions of the S3 are out of backorder and now “In Stock.” I’ve also updated the prices of the unlocked versions, which have all dropped. Wirefly is selling the Sprint 16GB Galaxy S3 in blue for $180 with a two-year contract. UPDATE 6/22/2012: The S3 has been moved from a pre-order to a “Buy Now.” It appears that it is in stock. Free shipping. UPDATE 6/26/2012: Though Wirefly has been saying “Buy Now,” it has another page on its site that says the S3 “Ships When Available” which may indicate that it doesn’t really have the phone in stock at all. That’s deceitful, Wirefly! Best Buy doesn’t appear to have any Galaxy S3 stock available in stores yet, but it is accepting pre-orders on its website, though it doesn’t boost our confidence that the Galaxy S3 page on Best Buy’s site is down. Currently, AT&T and Sprint versions of the S3 are available. Below are some links to the versions available for pre-order. The price seems to be $200 for the AT&T blue S3, AT&T white S3, Sprint blue S3, and Sprint white S3. UPDATE 6/26/2012: Best Buy has fixed the link to its Galaxy S3 page. All phones are still on “pre-order,” though Best Buy attempts to hide this fact. UPDATE 7/05/2012: Best Buy now shows that it will “soon” have the T-Mobile and Verizon versions of the S3. All AT&T and Sprint models are still marked as “Pre-order” so it could be a while before you receive them. We recommend avoiding Best Buy at this time since there are faster options. UPDATE 7/10/2012: Best Buy is now selling the T-Mobile version as well and it appears that many stores now has S3’s in supply. I hadn’t heard of this retailer before, but Chris Chavez at Phandroid has pointed to a page on the site saying that HHGregg will have the Verizon version of the phone by July 12th. ADDED 6/26/2012: I added this retailer to the list. UPDATE 7/05/2012: Nothing new to report. Its still coming July 12. UPDATE 7/12/2012: The HHGregg website still says July 12, but the pre-order screen hasn’t changed. Nobody has ever attempted to launch a phone on all major US carriers simultaneously before, and we’re learning why right now. Either Samsung was not prepared for this launch or demand has sorely outstripped production. Please help us keep this list updated. If you find the S3, let us know where. We’ll do our best to update this as often as possible until the S3 is widely available. UPDATE 6/22/2012: I checked and most status updates haven’t changed. There appear to be more versions of the Unlocked S3 available on Amazon. I updated the numbers and prices, which shifted slightly. Wirefly is now selling the device as a Buy Now instead of Pre-Order. UPDATE 6/26/2012: I’ve put an update under each section. Few things have changed. It’s still quite difficult to find the Galaxy S3. UPDATE 7/05/2012: I updated every section again. Amazon and Sprint now have the S3 out of pre-order and available. Verizon pre-orders may arrive as early as July 6 and it will be available for good starting July 11. AT&T stores will get the S3 on July 6. Other updates were also added. UPDATE 7/10/2012: The S3 is now available at Best Buy and should become available at Verizon and US Cellular on July 12. UPDATE 7/12/2012: The S3 is now available at US Cellular (except the 32GB) and Verizon.